I have requested for a controller for testing purpose. My main purpose will be to test the IO points and connect a modbus meter on the RS485 bus. I would like to know how to configure this meter inside the controller and configure the modbus register in it to read the values. 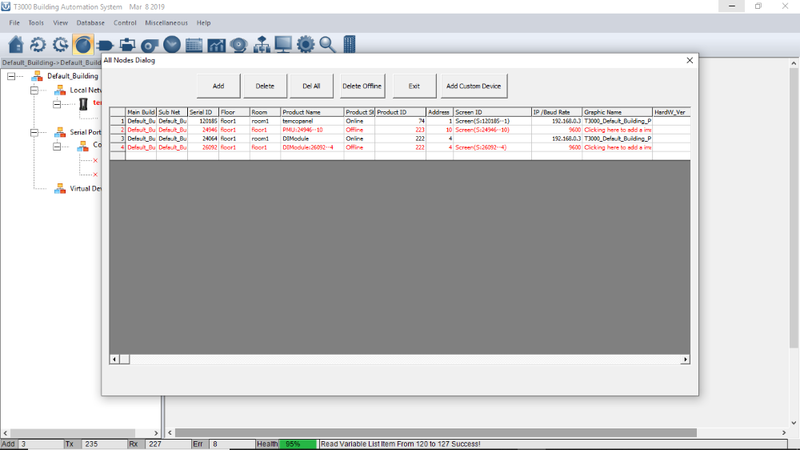 Additionally will i be able to discover all the points on Bacnet IP on a third party application. Where VAR1 is the local variable on the controller, 2 is the modbus ID of the power meter and 303 is the modbus register of interest on the power meter. 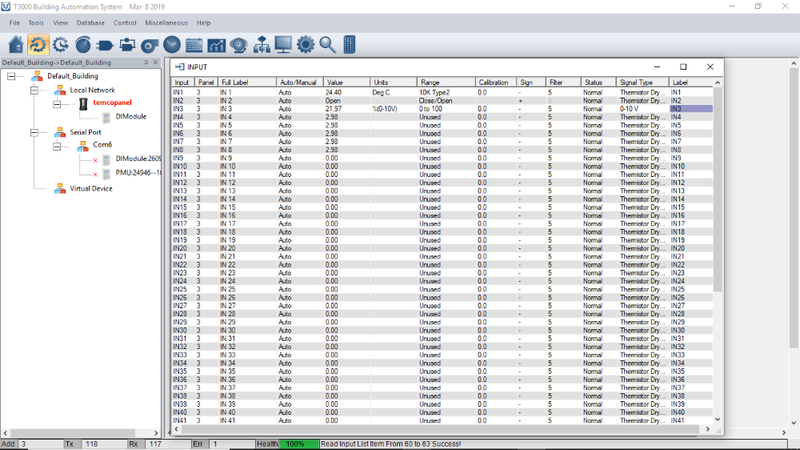 Then on the ethernet side, you can see all the bacnet objects on the T3 controller. 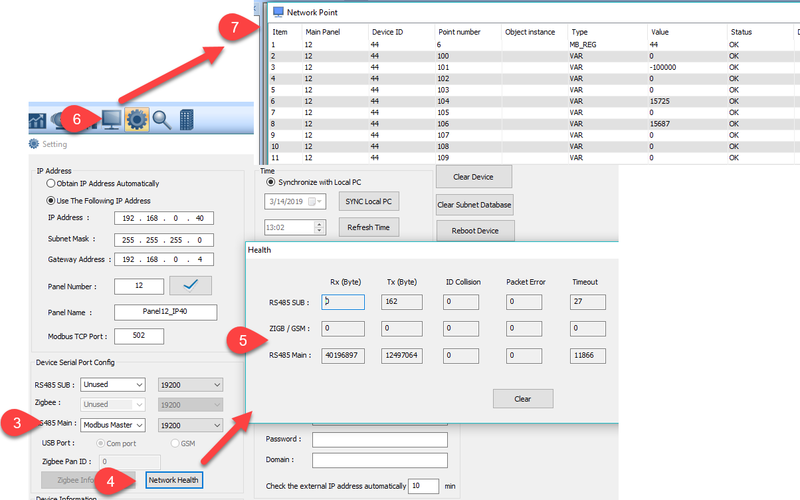 The local variable VAR1 will show up as AV1 in the bacnet objects list. Thanks for the response Maurice. Let me try this and if any doubts i shall revert back. Hi I have tried the modbus connectivity but the modbus device is not getting online in the T3000 controller. I am using T3-TB for the testing purpose. Attached are the screenshots of the settings for your review. 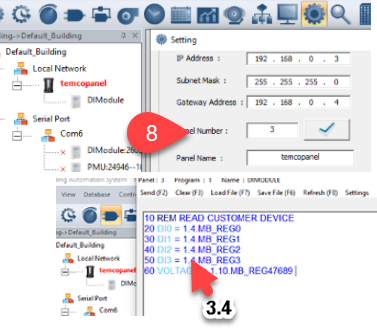 Here is what I think you have there for your network setup, the item at Tab1 is a third party device on the Modbus subnet. Note that the 3rd party devices don’t show up in the T3000 left hand tree, its on the todo list though. 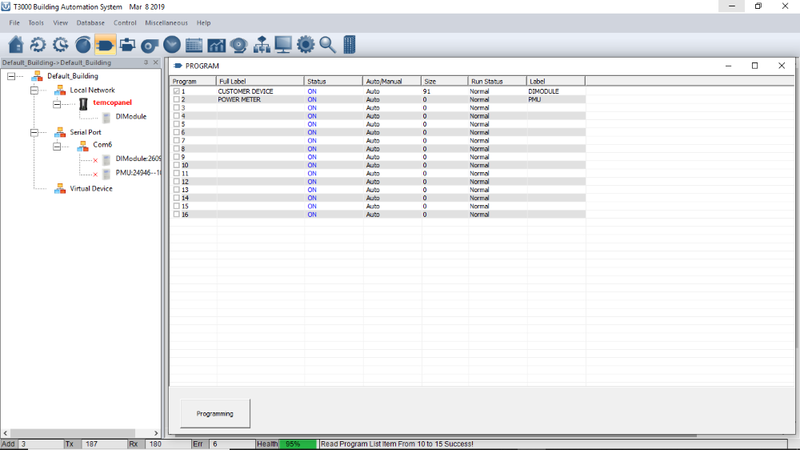 The commands to read a register are as showing at Tab2 (line 7) in this screen capture, the T3 controller is set up as controller number 3 as you can see at Tab8 so you need to change your program from 1.4 everywhere, to 3.4 where 3 is the main T3 panel ID and 4 is the modbus ID of your subnet device. 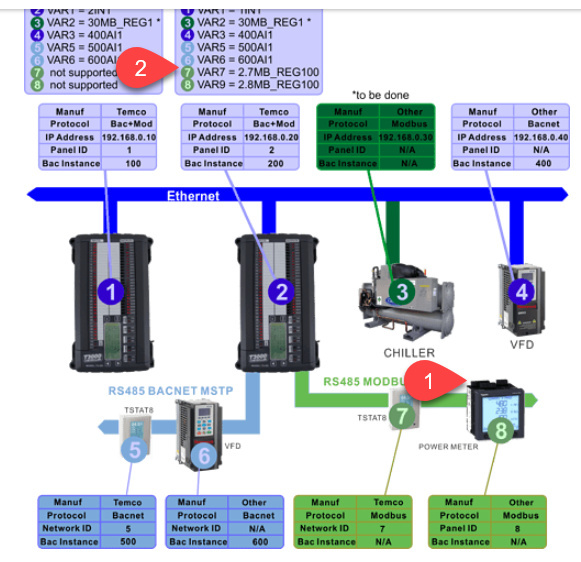 Other notes: Be sure to set up the RS485 subnet port as Modbus master at Tab3. You have written a program already so the network activity should start to show up immediately which you can see clicking the network health button at Tab4, it brings up the network activity at Tab5. 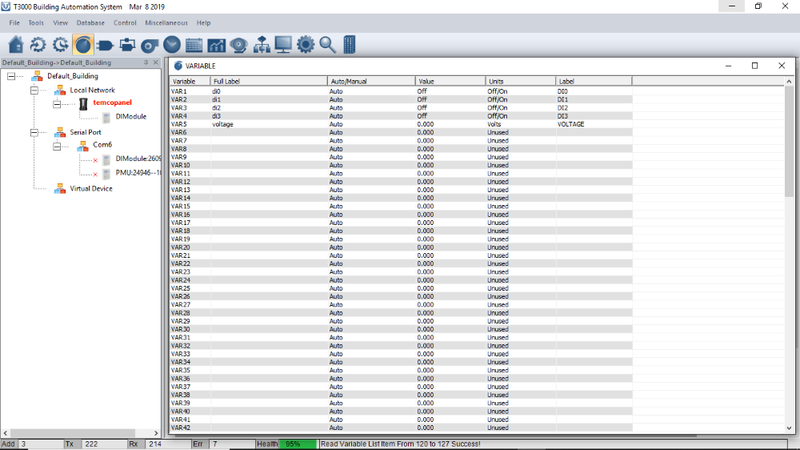 You can also see more details by checking the network points table at Tab6 which brings up the list of all network traffic in and out of this particular T3 controller, showning at Tab7. Kindly advise how to proceed to retrieve the information in the program. I’ll need a little more info. If the data is coming into a T3 controller then you can do some math on it with a control basic program and send it out through any port with any protocol. If you want to just transparently route the data from one port to another that’s also possible, let me know a few details and I’ll answer better. I trying to read the modbus registers on the T3 controller. 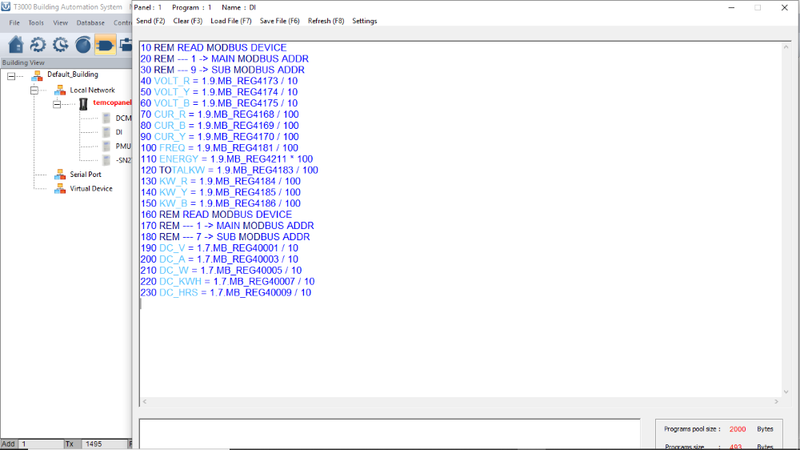 I have tried with the program but it seems the data is getting read by the T3 maybe due to the register type of the modbus registers. 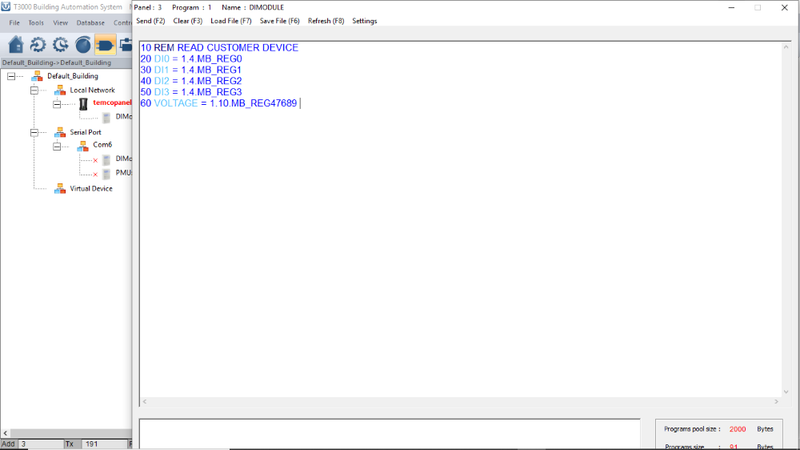 The registers of the modbus points are all float type so do I need to write a different program for this meter. attached image for your understanding. Kindly refer statement 190 and on. The registers are float type (32 bit).